Social media reactions exploded over the picture of a dress a couple of hours ago. 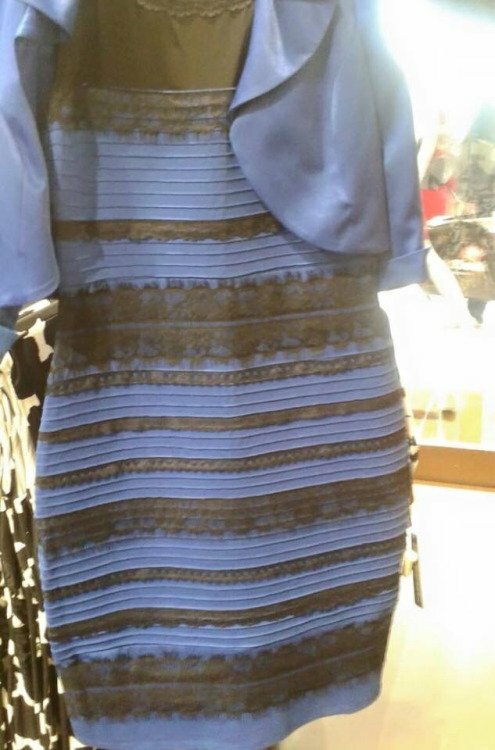 The question seems simple enough but turned out tricky: Is this dress white and gold or blue and black? The colors seem incredibly different and initially I thought this was some kind of a social media joke. But apparently people were really not agreeing on which colors the dress really had. A still-running poll on Spiegel Online reveals that 13% of the voters think it’s black and blue while 87% are sure it is white and gold. So why do we see it so differently? First, the poor exposure of the photo makes the lightning conditions quite ambiguous. Second, like some similar visual illusions, the answer lies in the context of the picture. In the checker board illusion, color constancy makes square A appear darker than square B, when in fact they are both exactly the same shade of grey.. Color constancy is a feature of the human color perception system which ensures that the perceived color of objects remains relatively constant under varying illumination conditions. This helps us to identify objects. In the dress example, it could be that a black dress is under yellow light or a white dress under blue shadow like in the picture below..
At this point it becomes hopefully a little clearer. At least for me, the colors now switch from white to blue at least, while I am still not 100% convinced of the blackness. Last but not least, here is an actual product picture of the dress an Amazon’s website. The most recent comments are hilarious. This is quite interesting, since such illusions only present themselves in the real world very rarely.